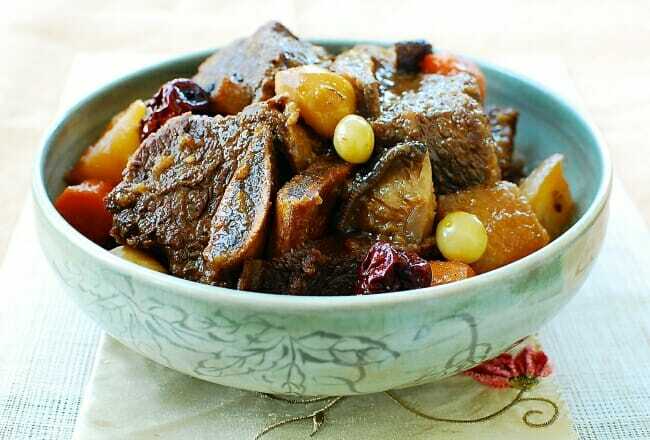 Galbijjim is a braised beef short ribs dish in a rich sauce. You can make these tender, succulent short ribs at home with this easy, authentic recipe! 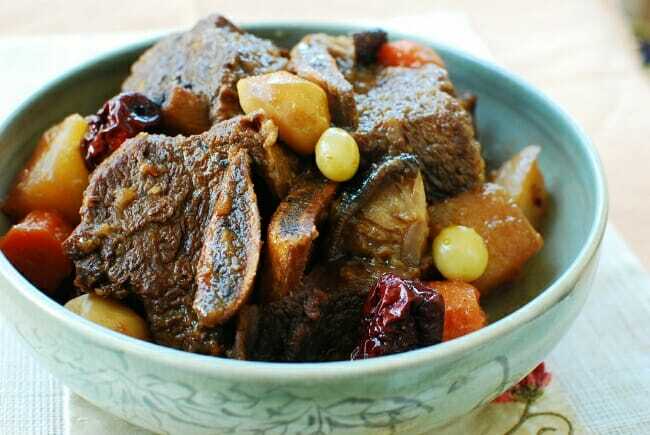 Galbijjim (or kalbi jjim) is braised short ribs, which is typically served on traditional holidays and special occasions in Korea. I made these ribs for my father-in-law’s birthday, a couple of weeks ago, and again for my son when I visited him this weekend. Galbijjim is a definite favorite at our house! 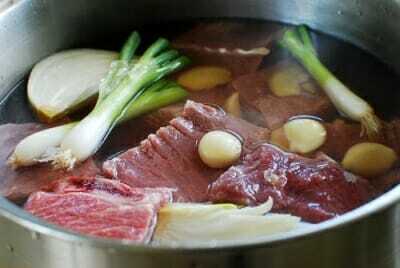 In contrast to the braising method typical of Western cooking, Koreans do not sear the meat before braising them. The ribs are first parboiled in water with the aromatic vegetables and then braised in a sweet and savory braising liquid. Parboiling is a technique used to remove excess fat and blood from the ribs. I boil the ribs in a small amount of water and use the resulting stock in the braising liquid. Chestnuts, dates, pine nuts, and gingko nuts are customary garnishes that make this dish look very elegant, but the ribs will still be delicious without them. These succulent ribs, in a rich sauce, will be perfect for any of your special occasions! Then again, why wait for a special occasion to make this tasty comfort food? Trim off any excess fat. Rinse the ribs and let them sit in cold water for about 30 minutes to draw out excess blood. Drain. In a large pot (5 or 6 qt), bring 4 cups of water to a boil. Add the ribs, onion, ginger, garlic and scallions. Bring it to a gentle boil, uncovered. Skim off the scum on the top. Reduce the heat to medium and cook for 30 minutes. Remove the ribs, reserving the stock. Mix together all the braising liquid ingredients. Return the ribs to the pot. Pour the braising liquid over the meat. Set it aside to marinate for about 30 minutes. Add 2-1/2 cups of the stock to the marinated ribs. Cover and bring it to a boil. Reduce the heat to medium low and simmer for 30 minutes. 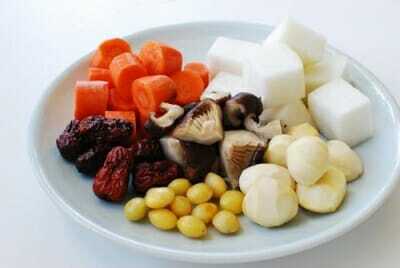 Stir in the vegetables, leaving out the optional garnish ingredients. Continue to simmer, covered, for about 20 minutes. Stir in the optional garnish ingredients. Return to simmer, uncovered this time, for an additional 10 - 20 minutes*, or until the sauce is thicker and the meat is tender but not falling apart. Wow this looks so delicious. 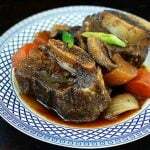 I’ve never tried Korean braised short ribs and this photos are telling me I better make this one day! 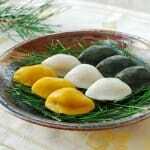 This with a bowl of steam rice would be my ideal and perfect meal~~~! Nami, Emily and Jen: Thank you for stopping by and checking out the recipe. Hope you get to make this dish soon! Thanks, Andrea! I know you and your family will love it. Ummm, I love short ribs. This looks very appetizing. Thank you, Cynthia! It is very tasty. This looks scrumptious! 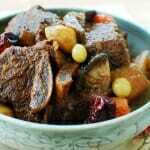 Korean Galbi jjim is the best braised beef dish in the world. Thank you, Holly! I agree! This looks really, really delicious! Seeing that you used Asian pear in this recipe reminds me of a Korean friend’s Asian pear salad with shrimps that was absolutely delicious! Unfortunately, I can’t remember what it is called. Congrats on the picture! Thank you for sharing this recipe! I just made this for dinner tonight and it is absolutely delicious! I am looking forward to trying more of your recipes soon. Laura – I am thrilled to hear that. Thank you so much for letting me know! 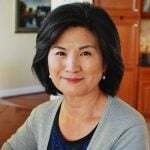 I look forward to hearing more about your cooking! What a lovely dish! 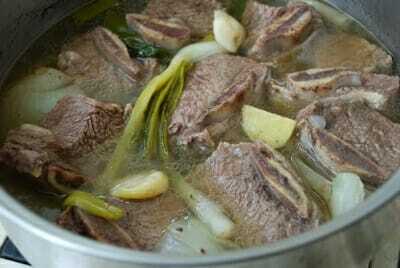 For dishes like beef stew or braised beef, I usually start with searing the beef and I`ve never tried parboiling it. I`ve also never used pear to cook meat before. So you gave me many new things to try out! I`ll definitely let you know if I make the galbijjim. Thank you! Thanks for re-posting this. I just made it for dinner and it was divine! Such fantastic flavors! Hyosun, I am so looking forward to when I can buy your cookbook. I have loved every recipe of yours that I have made. Thank you so much!!! Arudhi – Thank you! Try it. I know you will love it. Michelle – So thrilled to hear you made this and it turned out well for you. And thank you for your support and encouragement! Nick – I am sorry to hear the step isn’t clear to you. Braising basically means slow cooking the main ingredient in liquid. 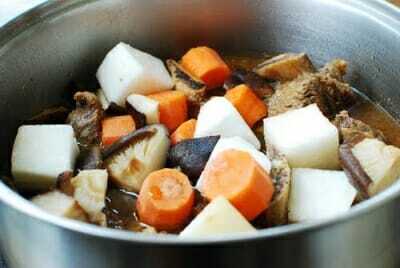 The sauce (which I called braising liquid)in this recipe is used to slow cook the meat. In the step you’re referring to, the ribs, which have been boiled and removed from the the stock,are placed back in the pot and marinated in the sauce (braising liquid)before being slow cooked. Hope this helps, but do not hesitate to let me know if you have any other questions about the recipe. Nick – No heat for marinating. I am going to see if I can make that clear in my recipe. Koreans typically do not sear the ribs before braising them. Parboiling is the traditional technique. Thanks again for your questions and feedback! Let me know how it turns out if you make it. No problem, Nick! All good discussions… Enjoy! Sure! That will be a good point to stop and pick up later. Let me know how it turns out. It was divine! My husband declared: All beef should be cooked this way! 🙂 I think next time I would marinate it again overnight – tastier and not as time consuming.. probably even store it in the freezer until ready to braise with the veggies. Thank you so much for the delicious recipe Hyosun! That’s wonderful!! I am delighted to hear that. I am sure freezing it until braising will work well too. Great idea! Thanks for taking the time to let me know how it turned out. Oh please tell your husband I agree with him. Thank you! You can simply omit it. 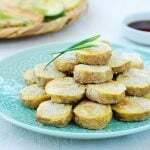 Also, although not traditional for this dish, you can use potatoes. Enjoy! Hi, I made this the other day and it’s the best galbijjim recipe I’ve tried so far. Thanks for all your great posts! Thank you so much for these amazing recipes! My husband is Korean and grew up eating a lot of Korean food. 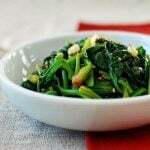 I had several Korean recipes under my belt, but this has really expanded my repertoire! I am looking forward to impressing my in-laws during their next visit! Now if only the Korean language was as fun to master…. I’m making this dish tonight but have already made a few of your others. Yum! hello ms. Hyosun Ro, i am in the process of making your galbijjimm recipe, actually i started boiling the meat last night. Looking at the ingredients, i noticed that you don’t have chili powder or chili flakes or other ingredients to give it a little kick. If i want to make the dish a little spicy, what and how much of it do i have to add and at what point in the recipe do i add them? I know your recipe will turn out great. looking forward to your reply. Add 1 to 2 tablespoons of gochugaru (chili flakes) and gochujang (chili paste) in equal amounts in the braising liquid. It’s really up to your taste. 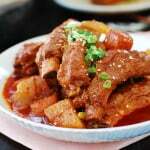 For your reference, I used 2 tablespoons of each in the spicy chicken stew here: http://www.koreanbapsang.com/2012/12/dak-doritang-korean-spicy-chicken-stew.html#.UQB4pyfO1hZ. Thanks for using my recipe. Enjoy! Loved this recipe! We did everything according to your recipe but put less beef (about 2.6 pounds) and topped it up with more carrot and turnip. It was so delicious. And so simple to make! We are definitely going to be making this for our families. 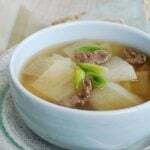 Any chance you’ll be making jangjorim (ideally in a slow cooker!) any time soon? Hello! Can I replace sugar and honey with Korean Mulyeot/Corn Syrup? Hi Hyosun! If I modified this recipe for use in a pressure cooker, how do you suggest I would do it? I love all your recipes btw, I have tried so many of them! Hi Ali – Sorry, I haven’t cooked this in a pressure cooker. For a slow cooker, I don’t use as much liquid to cook the ribs. 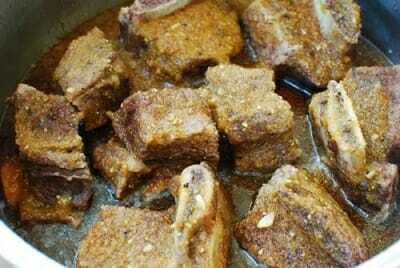 See my slow cooker galbijjim recipe. I’d like to say the same should apply to the pressure cooking. Let me know if you try it in a slow cooker how it turns out for you. I love this! Thanks for the easy recipe. Cheers from New Zealand. Thanks very much for the recipe, it turned out wonderful. I had it for dinner last night and it was perfect in this cold weather. Kalbi Jjim is one of my all time favourite Korean dishes and I have been wanting to cook it for a long time. 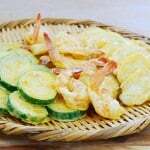 Although not Korean, I first came to experience the cuisine whilst in university in Switzerland. I had a few Korean friends and they introduced me to it. I look forward to trying out the other recipes on your blog. I’m a massive fan of Kimchi Jjigae. Hello! This looks absolutely delicious! I was wondering, if I wanted to make it spicy Galbijim, what should I put? Thank you! Hello Sierra – You can put some gochugaru and/or hot chili peppers. 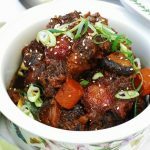 See my braised spicy pork ribs for more information. Enjoy! Excellent recipe. I didn’t use any of the suggested veg, and went for just pure meaty goodness. Opted for 2 tablespoons of sugar, but should have gone for 3. Still tasted great. I made it with a pressure cooker. I boiled the ribs first around 10-15 minutes to remove the impurities, and then cleaned the ribs with running water. After that, I put the the ribs in the pressure cooker, along with the braising liquid, garlic, ginger and onion. 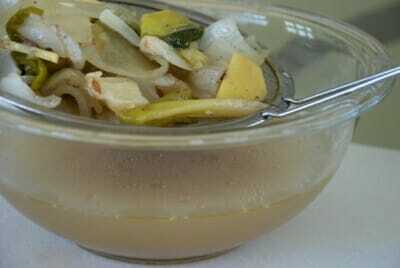 I also added a cup of beef broth. Then pressure cooked it for 27 minutes, natural release. After that I removed the ribs, leaving the stock in the pressure cooker, and added the carrots, pressure cooked it for 1-2 minutes. Then added the ribs back to the pressure cooker 🙂 Delicious! I usually made this the day before, so I can refrigerate it and the next day I will just have to remove the layer of fat and reheat it! If I double the meat, should I double everything else? I made this in the pressure cooker and it was absolutely delicious. Very flavorful, sweet but not too overpowering, savory and just good for the soul. My husband is already looking forward to me making it again and suggested that we have this on Thanksgiving instead of turkey. Awesome! Thank you so much for letting me know! I made this dish following recipe with exception of the honey. It came out awesome. My family loved it. Thank you!!! So happy to hear that, Esther! Thank you so much for taking the time to write me.